Rockefeller Cosmetic Dentistry is located at 630 Fifth Avenue Suite 1803, New York, NY 10111. In the event of an emergency, please call us at (212) 581-1091. Accidents happen — even with your teeth. Due to the severe pain associated with oral trauma, we understand the need to immediately fix the issue. So whether you’ve broken or lost a tooth or are experiencing chronic gum bleeding, severe pain, or oral trauma, we’re here to help you — today. Our Manhattan emergency dentist services are available 7:30am-7:30pm Monday through Saturday at our Midtown location. Available Sundays for emergencies only. Contact us (212) 581-1091 and one of our staff members will be in touch shortly. Concussion – when an injury occurs to the tooth structure without dislodging it (allowing for increased mobility), but with pain associated to tapping the tooth (percussion). Treatment: Typically no medical treatment necessary. Patient Care: Soft foods recommended for 1 week. 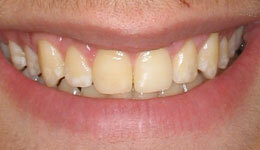 Subluxation – an injury that increases mobility of tooth without displacing it (the tooth will budge, but not move). Gingival bleeding confirms diagnosis. Treatment: Though generally unnecessary, a temporary splint may be placed across the damaged tooth for up to 2 weeks. 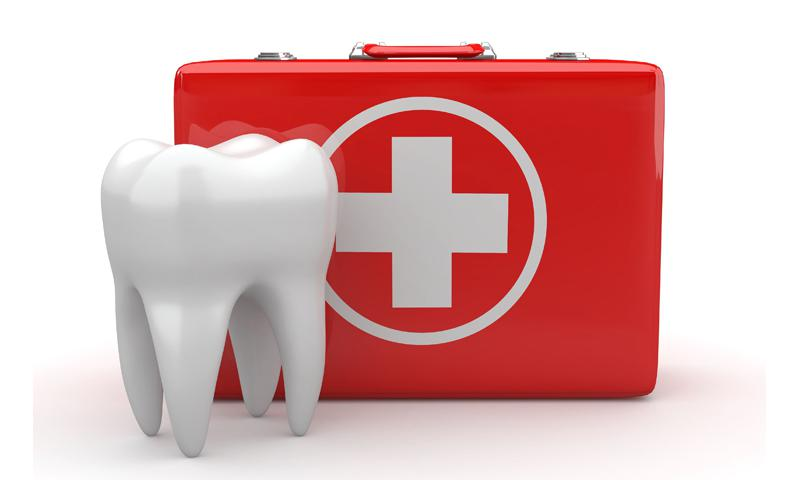 Patient Care: Soft foods for 1 week, good oral hygiene practices (soft toothbrush). Extrusion – a partial displacement of the tooth out of the socket. Treatment: Clean exposed root with saline, reposition & re-insert tooth into socket, and stabilize for 2 weeks using a flexible splint. Patient Care: Soft food for 1 week, brush with a soft brush and rinse daily. Lateral luxation – a fracturing of the bones in the gum surrounding the tooth accompanied by displacement of the tooth (non-axial). Treatment: Rinse area with saline, apply local anesthesia, reposition tooth, then apply a flexible acrylic or wire splint for 4 weeks. After 4 weeks, the splint is removed and your dentist tests for pulp necrosis and root resorption. Intrusion – when the tooth is displaced into the alveolar bone, often accompanied by a fracture to the socket. Treatment: clean area with saline, suture gingival laceration, then allow 1-2 weeks for natural (spontaneous) repositioning of tooth. 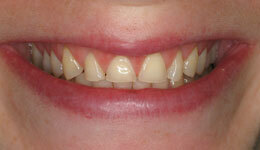 If this does not work, orthodontic or surgical (with forceps) reposition may need to be performed. Patient Care: Soft foods for 2 weeks, brush with a soft brush and rinse daily. Avulsion – when a tooth is completely displaced, leaving behind an empty socket or one partially filled with a coagulum. Treatment: IMMEDIATELY seek professional care in the event of a lost tooth. Avoid touching root (grab by crown) and replace in socket, keep in place with a handkerchief. Avoid storage in water, milk works well. Once at our dentist’s office, the dentist will verify proper placement (or reposition tooth), clean area with saline, then apply a flexible splint for 2 weeks. During the interim, you will need to take antibiotics to prevent infection and discoloration. On the next visit 7-10 days later, a root canal treatment should be initialized. Patient Care: No contact sports or hard foods for at least 2 weeks. Brush and rinse with a soft brush after each meal. Infraction – when the enamel of the tooth cracks without damaging the structure of the tooth. Treatment: When a marked infraction occurs, treatment involves etching and sealing of the mark to prevent discoloration, otherwise there is no treatment necessary. 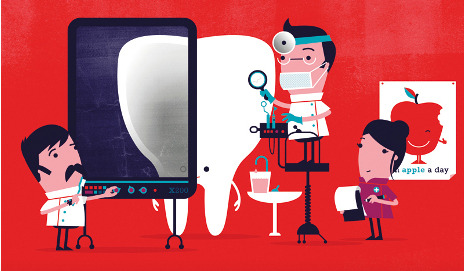 Patient Care: Maintain good oral hygiene, no follow-up necessary. Treatment: If fragment available, your dentist will bind it back to the tooth. 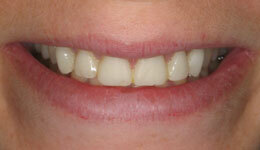 Otherwise, dentist will smooth sharp enamel edges and replace chip with composite resin. Patient Care: Maintain good oral hygiene and schedule a follow-up in 6-8 weeks and again in a year. Enamel-dentin fracture – a break that does not affect the pulp, but does damage the enamel and dentin, typically resulting in a large portion of the tooth breaking off. Treatment: If fragment available, can be bound back to tooth. Otherwise, your dentist can create a glass-ionomer cover or form a permanent composite resin restoration. Before leaving your appointment, the dentist will check for fragments via a radiograph of lips and gums. Patient Care: good oral hygiene and a follow-up appointment 6-8 weeks, then a year, later. Enamel-dentin-pulp fracture – a break that affects the enamel and dentin as well as exposing the pulp. Treatment: Dentist applies local anesthetic and isolates tooth with rubber dam, then cleans area of pulp while performing a pulpotomy. Your dentist will then apply a cotton swab until bleeding stops. After pulpotomy material is placed, seal with glass ionomer cement and then restore full tooth with composite resin. Patient Care: Avoid solid foods for 2 weeks, after 6-8 weeks make a follow-up appointment, then another after a year to ensure pulp and tooth health. Crown-root fracture without pulp involvement – a break that involves the enamel, dentin, and the surface level to the tooth root (cementum), but that does not expose the pulp. Treatment: Remove fracture with forceps, clean area and disinfect, suture gingival lacerations (if present), allow gingiva to reattach to dentin, then apply a glass ionomer above the gingival level and repair tooth with composite resin. May require an extraction or replacement depending on severity and angle of break. Patient Care: No solid food for 1 week and schedule a follow-up in 6-8 weeks, then again in a year. Good oral hygiene is important to resisting infection. Crown-root fracture with pulp involvement – the same fracture as above, but higher up on the tooth, exposing the pulp as well as damaging tooth structure. 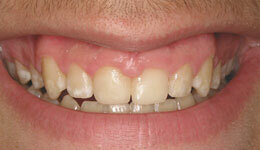 Treatment: Can be temporarily stabilized by affixing fragment to adjacent teeth. Otherwise, there are 5 common treatments: fragment removal and gingivectomy, orthodontic extrusion of fragment, surgical extrusion, decoronation (root submergence), or extraction in very deep root fractures. Patient Care: No solid foods for 2 weeks, maintain good oral hygiene. If temporarily stabilized, soft foods for 2-4 weeks. Root fracture – a break in the root of the tooth that includes enamel, dentin, cementum, and pulp. Treatment: Rinse exposed root surface and reposition, then stabilize with a flexible splint for 4 weeks (up to 4 months, depending on closeness to cervical area). Monitor healing for up to one year to make sure root necrosis does not occur. Patient Care: Soft food for one week paired with good oral hygiene. After 4 weeks (to 4 months), remove splint. Clinical and radiographic control after removal of splint. Follow-up at 6 months, one year, then yearly for 5 years. Alveolar fracture – when the alveolar process (tooth-bearing part of the jaw) breaks, resulting in one tooth dislocating or several teeth moving as a unit. Treatment: Clean area, suture gingival wounds if present, then reposition tootth/teeth segment. Dentist will provide a temporary flexible splint to stabilize teeth segment. After 4 weeks, splint removed and further exams performed. Patient Care: No solid foods for 2 weeks while maintaining twice a day brushing. Follow-up appointments at 6-8 weeks, 4 months, 6 months, 1 year, and annually for 5 years. Jaw fracture – a break that may fracture any number of parts of the mandible, and may or may not affect the alveolar process. Treatment: Manual repositioning or forceps repositioning of displaced segment followed by stabilization using a splint. 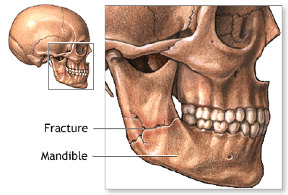 Intermaxillary immobilization to prevent further breakage. Alternatively, surgical stabilization coupled with plating may be applied. Splint is removed after 4 weeks. Patient Care: Avoid solid foods for 2 weeks, heavy chewing or large movements of the jaw for 4 weeks. Follow-up appointment in 4 weeks for splint, then in 4 months, 6 months, a year, and annually for 5 years. To learn more about our emergency dentist services/urgent oral care, please call our Midtown Cosmetic dental office at (212) 581-0191.